It’s trendy to love spicy food nowadays—especially if you’re a millennial, I’m told chiles, commonly referred to as peppers, can be so confusing. Most people think they’re all spicy, except for sweet bell peppers. (Those people have never had a Jimmy Nardello sweet red pepper, which taste like candy and are delicious raw.) 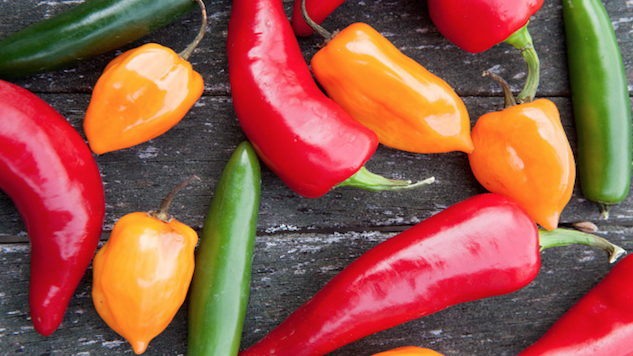 And just because something’s labeled a chile pepper doesn’t mean that it’s hot; that’s why we’ve got the Scoville scale to help us sort it all out. There are so many different kinds, too, that it’s become something of what cookbook author Judith Finlayson calls a “work in progress” to maintain a record of all of them. However, the chile’s ease of growth, transport and preservation attest to its widespread use around the world—from the Americas to Asia and Europe and Africa. Chiles possess natural antimicrobial and pain-relieving qualities; you’ve probably seen topical creams to relieve sore muscles that contain capsicum (that’s the plant’s name). Chiles are kind of amazing. Part history, part guidebook and part cookbook, Judith Finlayson’s The Chile Pepper Bible: From Sweet to Fiery and Everything in Between is compulsive reading for food (and chile lovers) in your life. Single-topic cookbooks can be a bit of a gamble, but this one takes it all a step further by showing the globe-trotting nature of the capsicum and the myriad ways they have surfaced and remained in a country (or even a region’s) signature dish. Well-detailed charts provide a sense of what each pepper looks like, its heat level and best applications for it, which may assist those planning gardens for next summer. Sidebars in each chapter focus on how historical and geographical information about chiles in particular places and food styles: Korea, Great Britain and Italy, along with Southwestern Cuisine. The 250 recipes cover just about every speck of land you can think of—and some perhaps you hadn’t considered—that grow them and whose people consume them. Finlayson doesn’t discriminate either, in her chronicle of the capsicum. Case in point: she includes Cincinnati chili, a regional American specialty. You’ll find recipes for pimento cheese, a dish that shows the pepper’s journey from the Europe to the South. There’s a recipe for Jalapeno poppers—bar food if ever there was one. But there are also more left-of-center uses, such as muhammara, a dip-like spread made with red bell peppers, walnuts, red finger chile, Aleppo pepper and other ingredients, and the North African hot pepper paste known as harissa, which makes 62 appearances in the cookbook, including its very own recipe. Two chapters in particular seem to illustrate chile’s adoption and myriad permutations. Think for a minute about all the soups in the world (not to mention chilis—you know, the bean-based heavy soup) that require some level of heat. Chinese Hot and Sour Soup. Thai Coconut Chicken. Bermudan Fish Chowder. Turkish Lentil Soup. Curries and creoles. Seeing all of those possibilities lined up attests to the power and popularity of the chile. And the condiment chapter brings the heat, too. Everyone knows a sriracha lover or three, so Finlayson includes a homemade rendition for that popular item. I was thrilled to see a recipe for Turkish red pepper paste, which a local business near me makes and I tried to persuade them to sell, jarred, because it adds such a hit of flavor to soups and, in the case of this deli, hummus. Creating a condiment yourself might seem like an unnecessary, self-indulgent exercise, but it’s one of those small gestures when you’re making a dish that can change its whole flavor. It also gives you a greater appreciation for the process. In terms of recipes, Finlayson doesn’t really omit anything—this is a bible after all—but there are, as well there should be, some dishes that are bound to be surprises for many readers. How many people have made a Burmese potato salad, which incorporates tamarind and Thai bird’s eye chiles? Ditto a Berbere chicken stew from Ethiopia and a Cape Verde sausage stew? Unless you’re super gung ho about making world cuisines or you grew up with some of these flavor profiles embedded into your DNA, there’s undoubtedly some unexpected discoveries here. Speaking of surprises, Finlayson says the biggest one she encountered during her research has to do with chiles being included in the continuum of foods that are seeking and achieving protected geographical status—think Prosciutto di Parma, for example. “This reflects an awareness of what wine people originally identified as ‘terroir,’ that the unique environmental factors of a region strongly influence the taste of the agricultural products produced. Some chiles that have achieved these designations are the Basque chile piment d’Espelette, the Spanish chile pimiento Riogiana, florina peppers in Greece and the Byadagi chile in India,” she explains. This shift also likely reflects the fact that our love of chiles and spicy food in general shows no sign of abating anytime soon. Carrie Havranek is a recovering music critic and part-time baker who writes about food, farmers markets, chefs and restaurants—and sometimes travel—from her home in Easton, Pennsylvania. You may have seen her work elsewhere in Edible Philly, the Kitchn, or Frommer’s.